Download the 7 Things All Dogs Need poster! You’re getting a dog and it’s time to go shopping, but what to get? How many toys, which leashes are right? Does he need a harness, a collar or a bed? You can spend hundreds of dollars on supplies, but will you get the ones you really need? Here’s my list of the seven things all dogs need for a behaviorally healthy life. Whether you think your dog is ultimately going to sleep on your bed or in a different room, or even outside in a dog house, it is nearly essential he learn to love his relaxation time in a comfy crate meant just for him. This place will become his personal pooch palace; a home away from home when you travel; and his safe, quiet spot for when he needs a break from visitors at your house. Once you train him to love this comfy resting spot, it can become a key to helping with potty training, preventing household destruction, and car safety (if you don’t have a dog safety belt). For walking your dog you’ll want a flat collar, a front-attaching harness, or a head collar. The flat collar is convenient because dogs can wear it all the time. (For exceptions, read this article: Which Types of Collars and Harnesses are Safe for Your Dog?) A front-attaching harness gives more directional control, while the Gentle Leader head collar, Snootloop, or Halti head halter give the most overall control since the dog tends to go where you direct his attention. Be sure you take the time to train your dog to actually enjoy wearing the head halter and harness by pairing both with food at first (It's similar to training a dog to stick their nose in a muzzle). While most people are getting their arms pulled out of their sockets or are accidentally holding the leash in a way that gives their dogs the signal to pull, with your hands-free leash you’ll be half-way there to helping your dog learn to walk on loose leash. My favorite brand for both small and large dogs is the Buddy System because it’s lightweight and easy to adjust. For big, strong dogs you may want to order the Dog-Safe Hands-free leash sold by Blue Dog Training. If you’re used to feeding your dog out of a food bowl, think again. Studies have shown time and time again, animals prefer to work for their food, even when identical free food can be easily obtained from a nearby dish. A portion of your dog’s meal should be fed in some type of food enrichment toy. This makes the meal last longer, turns mealtime into a game, and provides enrichment for your dog. These food toys can also be used to distract and engage your dog, which can come in handy when you want to train him to enjoy being in a crate or lying calmly when guests are over. For a new dog, whether it’s a puppy or an adult, start training right away for the quickest bonding and the smoothest transition. 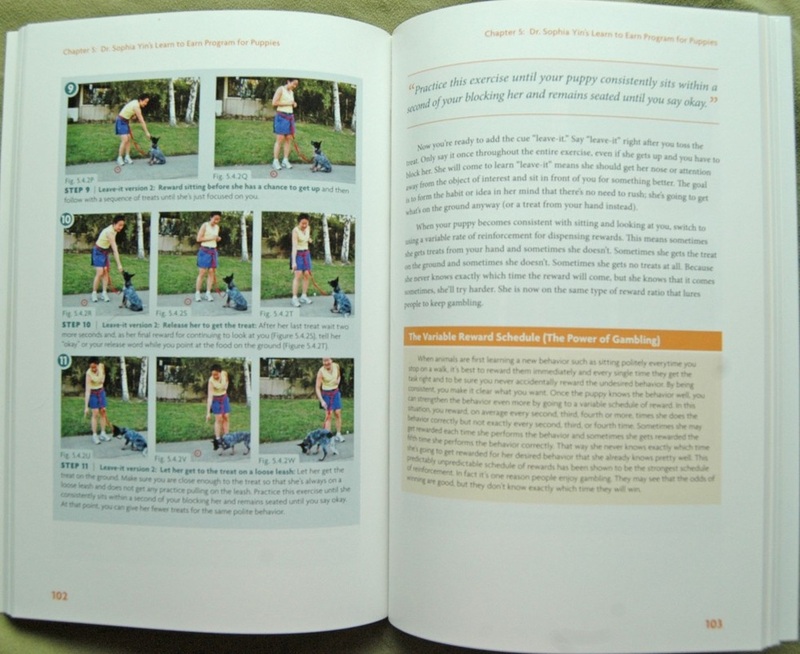 This book provides a step-by-step program for training dogs to give you their attention and look to you for guidance. It also gives you a plan for developing leadership and clear direction to your dog. You’ll need a bag for your dog’s kibble and some treats. The Doggone Good® bags are my favorite. They come in two ample sizes, open and close easily for quick access, and keep the treats inside rather than spilling out if you run. Its sturdy construction will survive yeas of heavy use. For most of your training, use your dog’s regular kibble (or daily allotment of food). But you’ll also need treats, at first, in more distracting situations. One of my favorite treats is Natural Balance® food roll because you can cut it into one-bite pieces for your dog and it’s soft and tasty for most of dogs. Feeding out of the food bowl is now considered the lazy way to feed your pet. It’s a wasted opportunity for training and interacting with your dog or for playing a food-related puzzle. Toss out the bowl and use the food for training and other enrichment purposes instead. Both you and your dog will have more fun!